On December 19, 1777, at 10 a.m., George Washington and his Continental Army marched out of Rebel Hill and Gulph Mills, past the Hanging Rock, and on to Valley Forge. As one historian wrote, “These grounds were the threshold to Valley Forge, and the story of that winter–a story of endurance, forbearance, and patriotism which will never grow old–had its beginnings here, at the six days encampment by the old Gulph Mill.” (see “The Gulph Hills in the Annals of the Revolution”, by Samuel Gordon Smyth, of West Conshohocken, in an address before the Montgomery County Historical Society, at Ashbourne, Pa., October 6, 1900; address included in Historical Sketches of Montgomery County, Volume 3, Montgomery County Historical Society (1905)). To PRESIDENT GEORGE READ Head Quarters, Gulf Mill, December 19, 1777. Sir: I have received information, which I have great reason to believe is true, that the Enemy mean to establish a post at Wilmington, for the purpose of Countenancing the disaffected in the Delaware State, drawing supplies from that Country and the lower parts of Chester County, and securing a post upon Delaware River during the Winter. As the advantages resulting to the Enemy from such a position are most obvious, I have determined and shall accordingly, this day send off General Smallwood with a respectable Continental force to take post at Wilmington before them. If Genl. Howe thinks the place of that Importance to him, which I conceive it is, he will probably attempt to dispossess us of it; and, as the force, which I can at present spare, is not adequate to making it perfectly secure, I expect that you will call out as many Militia as you possibly can to rendezvous without loss of time at Wilmington, and put themselves under the Command of Genl. Smallwood. I shall hope that the people will turn out cheerfully, when they consider that they are called upon to remain within, and defend, their own state. In a letter, which I had the honor of receiving from you some little time past, you express a wish that some mode may be fallen upon to procure the exchange of Govr. McKinley. As this Gentleman will be considered in the Civil line, I have not any prisoner of War proper to be proposed for him. The application would go more properly to Congress, who have a number of State Prisoners under their direction for some of whom Sir Win. Howe would probably exchange the Governor. I have the honor etc. P.S. Let the Militia March to Wilmington by Companies, or even parts of Companies and form their Battalions there; Because if the Enemy move, it will be quickly. To GOVERNOR PATRICK HENRY Camp 14 Miles from Philadelphia, December 19, 1777. Sir: On Saturday Evening I was honored with your favor of the 6th. Instant, and am much obliged by your exertions for Cloathing the Virginia Troops. The Articles you send shall be applied to their use, agreeable to your wishes.37 It will be difficult for me to determine when the Troops are supplied, owing to their fluctuating and deficient state at present; However I believe there will be little reason to suspect that the quantities that may be procured, will much exceed the necessary demands. It will be a happy circumstance, and of great saving, if we should be able in future to Cloath our Army comfortably. Their sufferings hitherto have been great, and from our deficiencies in this instance, we have lost many men and have generally been deprived of a large proportion of our Force. I could wish you to transmit the price of all the Necessaries, you may send from time to time. This will be essential, and the omission upon former occasions of the like Nature in the Course of the War, has been the cause of much unneasiness and intricacy in adjusting Accounts. I am persuaded that many desertions have proceeded from the cause you mention. The Officers were highly culpable in making such assurances. The Expedient you propose might, and I believe would bring in several, but I cannot consider myself authorised to adopt it. The Letters for the Marquis were sent to his Quarters as soon as they were received. I shall present you to him according to your wishes. He is certainly amiable and highly worthy of Esteem. I have nothing material to inform you of, Except that we are told by the Boston paper that a Ship has arrived from France at one of the eastern Ports, with Fifty pieces of Brass Artillery, 5000 Stand of Arms and other Stores. There are letters also which mention her arrival, but not the particular amount of the Stores. I have the honor etc. *To BRIGADIER GENERAL WILLIAM SMALLWOOD Gulph Mill, December 19, 1777. Dr. Sir: With the Division lately commanded by Genl. Sullivan, you are to March immediately for Wilmington, and take Post there. You are not to delay a moment in putting the place in the best posture of defence, to do which, and for the security of it afterwards, I have written in urgent terms to the President of the Delaware State to give every aid he possibly can of Militia. I have also directed an Engineer to attend you for the purpose of constructing, and superintending the Works, and you will fix with the Quarter Master on the number of Tools necessary for the business; but do not let any neglect, or deficiency on his part, impede your operations, as you are hereby vested with full power to sieze and take (passing receipts) such articles as are wanted. The Commissary and Forage Master will receive directions respecting your Supplies, in their way; but I earnestly request that you will see that these Supplies are drawn from the Country between you and Philadelphia, as it will be depriving the Enemy of all chance of getting them; and in this point of view, becomes an object to us of importance. I earnestly exhort you to keep both Officers and Men to their duty, and to avoid furloughs but in cases of absolute necessity. You will also use your utmost endeavours to collect all the straglers &ca. from both Brigades, and you are also to use your best endeavours to get the Men Cloathed in the most comfortable manner you can. You will be particular in your observation of every thing passing on the River and will communicate every matter of Importance to, Dear Sir, etc. While the main army left Rebel Hill and the Gulph on December 19, both places remained outposts for soldiers who could warn the army in Valley Forge if the British decided to approach from Philadelphia. Aaron Burr remained at a picket post at the base of Rebel Hill on Gulph Road during the Valley Forge encampment. General Lord Sterling, was in charge of the Gulph Mills encampment, and he spent the winter on Rebel Hill at the home of John Rees. And, Gulph Mills was also used as the site for many court martials while the army was at Valley Forge. Of course, Hanging Rock remains a natural landmark of the Gulph Mills/Rebel Hill encampment. Hanging Rock jutted far out over Gulph Road, much farther than it does today. 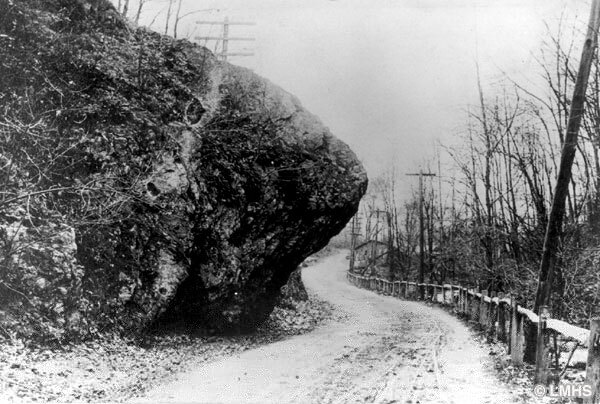 As cars got more prevalent and needed more room, Hanging Rock became a transportation problem. In 1924, the owner of the Rock, J. Aubrey Anderson, donated it to the Valley Forge Historical Society, which put a plaque on it noting that Washington and his army passed by it and that is marked the spot of the December 13 – 18 encampment. Stairs were built so people could climb up to the top of the rock to picnic at the small park that was up there until the P & W line was completed. All of us who lived in the area as children remember the school bus stopping every day at Hanging Rock until oncoming traffic stopped and the bus could swing out onto the other side of the road and around the rock. In 1995, the Pennsylvania Department of Transportation finally decided to cut down the size of the rock (s0me of it got knocked off in many truck accidents). In 1997, the Hanging Rock, also called the Overhanging Rock, was added to the National Register of Historic Places. So, thus ends my daily diary of the role that my childhood home on Rebel Hill and Gulph Mills played in the Revolutionary War on December 13 through 19, 1777. And, by Rebel Hill, I don’t mean just what we now as Rebel Hill today. Rebel Hill Road extended over into what we now call Union Hill (Hillside Rd., DeHaven St., etc.) during the Revolutionary War. Rebel Hill was one large and long hill until 1952, when the Pennsylvania Department of Transportation sliced through Rebel Hill to make way for the Schuylkill Expressway. My Mom was right when she talked about George Washington and Rebel Hill. We lived, and still own our family home, on historic ground. I am proud of our history, and I hope that others are, too. Tonight, I’m going to Valley Forge National Park to a program and reenactment commemorating Washington and his army’s march in to Valley Forge. Maybe next year we can do a program and reenactment of Washington and his army’s march in to Rebel Hill and Gulph Mills. Maybe at the community center on Rebel Hill? It is this proud history that started me on my path to write my latest novel, Becoming Valley Forge, winner of the 2016 Regional Fiction Award, Next Generation Indie Book Awards, and soon to be available at Valley Forge National Park Encampment Store. Called “a stunning saga” and “impressively well-written from beginning to end”, a description of the novel follows below. If you have any more stories about Rebel Hill and Gulph Mills or artifacts, please get in touch with me at svance@TheElevatorGroup.com. Read more about and order my other books and the other authors of The Elevator Group at http://www.TheElevatorGroup.com. I’m happy to speak to your group or historical society about the Six Days in December. Please email me at svance@TheElevatorGroup.com. Becoming Valley Forge by Sheilah Vance, ISBN: 0-9824945-9-2, $17.95, Trade Paperback, 565 pp; January 2016. Also available as an ebook on Amazon. On sale for $10 directly from The Elevator Group by clicking here. This epic historical novel shows how the lives of ordinary men and women who lived in the shadow of Valley Forge, Pennsylvania, were changed forever during The Philadelphia Campaign in mid-1777, when the Revolutionary War battles came to their doorsteps, leading them and their loved ones to Valley Forge from winter 1777 through summer 1778. James, a former slave, lives as a blacksmith on Rebel Hill in Gulph Mills, with his patriot friend, Daniel. Daniel is reluctant to volunteer for the army because he supports his mother and sister. James questions the sincerity of patriots who fight for freedom when so many African Americans are still slaves. But, the Continental Army’s occupation of Rebel Hill in early December uproots their plans. Orland Roberts, a Paoli farmer, leads a local patriot spy network with the help of his wife Teenie, daughter Betsey, and brother Norman, who owns a local tavern. As soon as they come of age, the Roberts’ boys–Fred and Allen–enlist in the Continental Army under the command of their neighbor, General Anthony Wayne, which puts them in the thick of The Philadelphia Campaign battles. The family outcast, Connie, who runs a brothel in Philadelphia that services many British officers during their occupation of the city, views the presence of both the redcoats and the patriots in the area as just another challenge that she has to conquer to survive, until a series of events causes her to put family ties above all else. Their paths converge, along with many other people’s, at Valley Forge, where General George Washington’s Continental Army, a young nation, and the fascinating characters in the book are forced to confront the reality and the aftermath of war, revolution, and freedom as they grow and become the meaning of Valley Forge.